Your lawn is an investment in your Home, and more importantly the Health of you and your family. So like all investments, make sure you invest in the right place. Talk to us about putting your hard earned money in to the best lawn for your place. Let us do all the hard work while you get all the best benefits. Your lawn is often the last thing you think about when you build your new home. It just seems like an extra that you don’t really want to think about at the time. But then you move in, and dirt and sand and mess starts to blow in and get walked in by your family and friends across your beautiful brand new probably white floors. Your house is your investment in your future. Your financial future, as well as your family time together. So protect your investment with a beautiful lawn that will stop all the dirt being spread onto your amazing new floors. And add, on average $70,000, value onto your home by placing the gorgeous green. But like all investments, make sure you talk to the RIGHT people before you start handing over your cash. There are so many different types of lawns available now, and making the right choice can be daunting. At Coastal Turf we pride ourselves on being very hands on. We know all the grassed from the roots up! We know how each variety will cope with kids and dogs (often because have tested them to our own homes) shade and sun, and lack or abundance of water. This hands on experience coupled with our knowledge of plants and our local area, means we can give you wise investment choices. Getting the Right Lawn for your home is really important. We believe in doing it once and getting it right. Thats why we offer free on phone and information we can email you, advice on the best preparation techniques as well maintenance afterwards. Give us a call, send us a text, shoot us an email and we will help turn your dirt pile into a magnificent lawn. 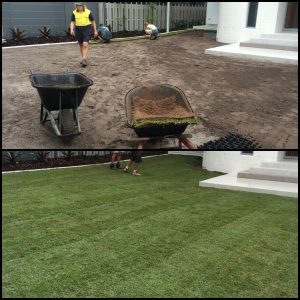 Go from Brown to Green lawn instantly!